Earlier this week a 13-year-old Indiana boy was charged with intimidation after he told Apple's Siri that he planned to shoot up a school. Siri obligingly gave him a list of three nearby schools that would be good candidates for such an activity. The young idiot posted his request to Siri and an iPhone screenshot of "her" response on social media. His Facebook friends reported him to police, and he is currently enjoying the accommodations at the Porter County Juvenile Detention Center. Despite Apple's claims that the Siri in the latest version of Apple's iOS is a combination of a butler, a concierge, and an all-knowing guru, reviewers and users say it is not as advertised. For instance, it turns out Siri is not very good at math. Testers have found that she fails at fairly simple math calculations. Just this week Apple iPhone users discovered that contacts listed in their phone could listen in - and view the camera - on their phones through the FaceTime app. Everything that was in the range of their phones (which people usually keep with them at all times, even in bed ) was open to the world. Apple claims they will fix the "bug" in a week. In the meantime, your only protection is to turn off the FaceTime app. Google and Amazon's offerings seem to be far better than Siri at most things, with Amazon the clear leader. Recently a young boy was caught cheating on his homework by asking Alexa to solve his problems. And even 4-year-olds have figured out how to order pizza using the home versions of these "personal assistants." For products that are relatively new, the acceptance of these home devices is remarkable. 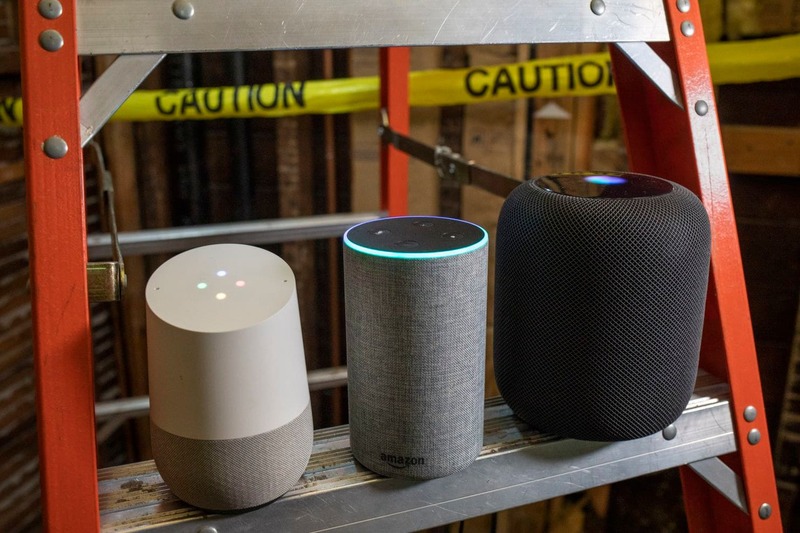 According to the Consumer Technology Association, one in ten of us plan to buy a smart speaker this year. In addition to telling corny jokes, they will supposedly be able to turn lights on and off, operate your security system, adjust your thermostat, and even cook your popcorn. You may consider such things either as very cool or a foolish waste of money. (It's not really that hard to push Start on your microwave or flip a light switch.) But I think the disadvantages far outweigh the advantages of these expensive toys. Security is a serious problem. Last spring Amazon's Alexa recorded a family’s private conversations and sent them to one of their contacts. All these devices record all your interactions with them. They claim they only use such data to remember what popcorn or music you like, but do you really believe that? And like all electronic devices, they are hackable. Do you want a device in your house listening to everything you say or do, when someone might be monitoring it? Google and Amazon's devices record all conversations within their hearing, but at least they allow you to go online and delete them. Apple's device offers no such security feature, and after 6 months it "anonymizes" your conversations - meaning that even if they were forced to give you access, you wouldn't be able to find yours. But they're still in Apple's monstrous database. It's the same with these devices - only worse. First, you have to make sure any product you want to control with these devices is one that they partner with. Second, if you get tired of the security breaches of one and want to switch to another, you may have to buy all new gadgets - and a new security system. 1) You shouldn't trust your private thoughts to an electronic device - especially if you're discussing a criminal activity. 2) You shouldn't trust the information these devices give you - it's often wrong. 3) Don't let your kid anywhere near these things, unless you want a surprise 70" TV delivered to your door. 4) Always be aware that whether you're buying a phone or one of the home devices, you are basically spending a lot of money on a device that may be spying on you. 5) Your Facebook "friends" aren't really friends - as the 13-year-old who headlined this article can attest.